I have the most sensitive eyes of all time, and I got it from my mama. They are constantly watery. It's so bad that I'm almost [dramatically] legally blind and refuse to get contacts. I used to be mortified, yet prepared, to walk into a classroom late and somebody ask "are you good?" because my eyes are tearing trying to adjust to the light. If a fuzz or dust gets stuck in my eye, my face is actually worse than Kim K's crying face. AND, if something goes wrong while I'm doing my eye make up, you guessed it, I need to remove the entire work of art and start over. Unfortunately this is not a drill. My mother is a huge fan of Lancôme and gets hooked on their deluxe sample bags. 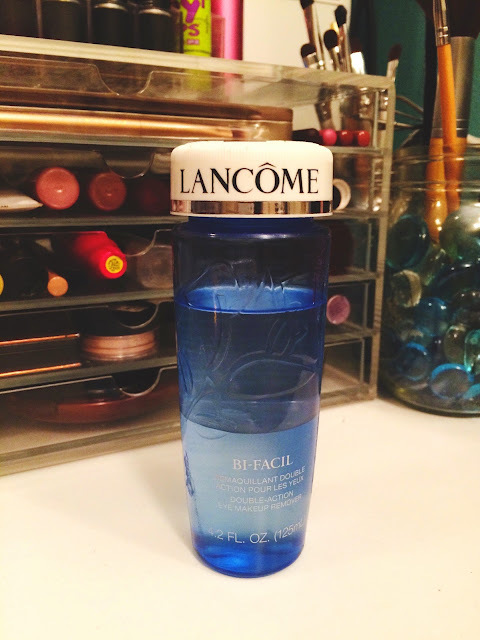 She let me have her full sized (4.2 oz) Lancôme Bi-Facial Eye Makeup Remover. I liked it, it worked well, and I totally ignored the fact that this was a $28 bottle. Turns out, you don't really know what you've got till its gone. I left it home and suffered half a semester at college without it. I tried 5 other brands including makeup remover pads and wipes that either didn't get the job done or stung so bad that I became more chinky-eyed than I already am. NWTS. Although I wear winged eyeliner to work daily and only waterproof mascara on the weekends, Lancôme Bi-Facial Eye Makeup Remover aids in perfecting my winged eyeliner with only a q-tip EVERY TIME. This stuff is not only my holy grail, but also award winning. I even got my friends addicted! I've had the pictured bottle for over a year and I've only made a teeeeeny dent in it. Do yourself (and your eyeballs) a favor, and splurge. A little goes a long way! you can purchase yours right off Amazon here!